It is important – yet sometimes difficult – to keep art and reality separate. When the purpose of art can be to provide an escape path from mundane reality, it is too easy to get ensnared by its monumental force. By which logic, when art becomes mundane its very purpose is lost. Will Oldham said recently "I like to listen to a song that I can disappear into but that is related to the things that I love or that I worry about and that might help me feel like I'm in company." While an artist need not necessarily live the scenarios or lives they depict or document, if they do their output arguably gains in potency. The founder members of The Low Anthem met at Rhode Island's Ivy League Brown University. All classically trained musicians, their studies followed compositional best practice rather than the school of hard knocks, despair and no-alternatives. The result is ten (original) dull and fictional songs that form Oh My God, Charlie Darwin. That said, opening track 'Charlie Darwin' is actually one of strange merit. Its docile and airy posterior sets the album off as another piece of interesting modern Americana beating similar terrain to Bon Iver. Though vocalist Ben Knox Miller's soaring falsetto is exceedingly close to Justin Vernon's, this is an aberration, for the rest is pleasant at times but ultimately a dull rehash of all things traditional and old-time. Standout 'To Ohio' hops aboard all the clichés of traditional Americana and pre-war blues as it proclaims "Left Louisiana on the rail line / Lost my love before a dime / On the way to Ohio" and so on, end. It's been done before - many, many times before – and conjures (then dilutes) the tales of woe documented in the pocket books of everyone from Blind Willie McTell to Karen Dalton to Jackson Browne, all of whom did so with monumental authenticity and intensity. The landscapes and scenes portrayed are snatched straight out of a Steinbeck novel. It's as if slimily yanked from the weathered hands of victims of the Great Depression after a long night spent sipping Italian mocha from a thermos flask in the grand hall of the university library. Later moments including the honky-tonk 'The Horizon Is A Beltway' which is so indebted to Tom Waits (the similarity reinforced by a cover of Waits' 'Home I'll Never Be') that you might as well just stick on Rain Dogs instead. 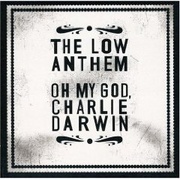 The Low Anthem try hard to employ a multitude of instruments, from pump organ to Tibetan singing bowl, but their use is superfluous to the overall picture. Furthermore, contextual shortcomings are littered throughout these songs. While a band like Fleet Foxes have recently built on the influences of their parents' record collections with vivid and dramatic prose and original compositional structures, The Low Anthem trundle along on a weak exterior without a solid engine of interesting content welded firmly under the hood. Unlike Americana masters Iron & Wine - who recently released The Shepherds Dog an album also brimming with organic and distinctive percussion, Waits influences and impressionistic imagery - the comparatively sparse and uninteresting lyrics of The Low Anthem, which perch raggedly and slightly inaudibly in the mix at times, prove these are not capstones to their act. In fact, at times they are utterly terrible, see: "If your clarinet should break / Do not cry a million lakes..." found on '(Don't) Tremble', and there are plenty more where that came from. While instrumentation evidently flows from The Low Anthem's fingers with a natural vigor, the battle for original composition has been hard fought, but ultimately lost. That being said, with a label like Bella Union behind them this release won't fail to make a strong showing in the collections of many set in their ways 40-somethings. At moments Oh My God, Charlie Darwin is a pleasant stab at traditional Americana folk. Unfortunately, it doesn't even begin to come close to its more commanding and electrifying peers currently doing the circuit, such as as Deer Tick and his ragged tobacco-stained hangover jams, Horse Feathers' bath time soul and J. Tillman's disarmingly beautiful balladry. All of which exude fluid, natural and uncalculated art that explores and exposes the modern world in a way we can all identify with, whilst providing the escape cord we all require to tug and, however briefly, disappear from it.